I've been to Iguazu in Argentina twice now and it's truly something I’ll never tire of. I could (and likely will) go again. Eleanor Roosevelt supposedly uttered "Poor Niagara" upon seeing Iguazu Falls Argentina. I finally made it to Niagara in 2016 and I have to agree with Mrs. Roosevelt on this one. The falls in Iguazu are breathtaking and massive and deserving of every hyperbolic term in the book. Here’s a complete guide to help you visit Iguazu Falls. While you can see Niagara from pretty much one vantage point and have seen it all, Iguazu is made up of 150-300 smaller waterfalls (depending on water levels). You can easily spend a few days here walking the different trails and viewing it from both the Argentine and Brazilian sides. The flight to Iguazu from Buenos Aires is a short 1 hour 45 minute hop to the northeast. There are a number of airlines flying this route now and the increased competition plus a recent currency devaluation at the end of 2018 has made flying domestically in Argentina much more affordable. The two main airlines are LATAM and Aerolineas Argentina and they offer the most routes, allowing for more flexible departure times. Norwegian Air is new on the local scene and worth checking to see if they offer a cheaper fare. Andes Air also flies this route but I’d avoid them unless they offer a truly competitive price (I’ve had some bad experiences with their customer service). 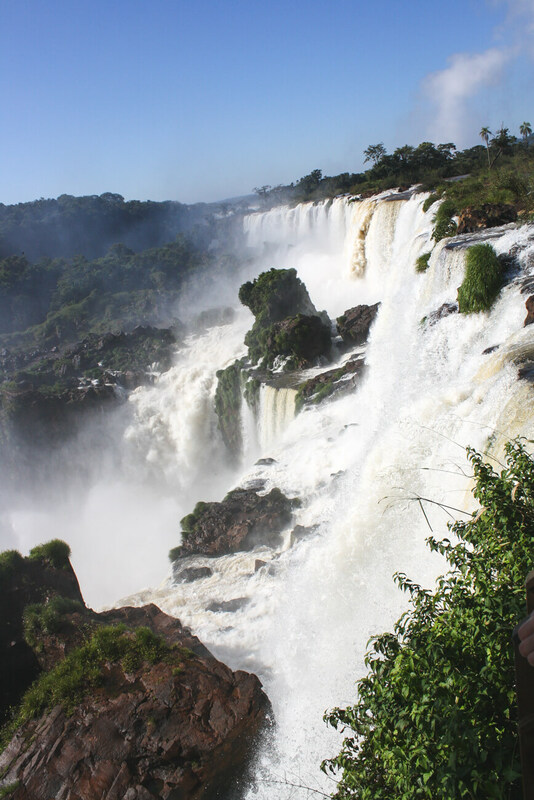 Compare airlines, dates and prices for flights to Iguazu here. Fly Bondi is a new locally based budget airline offering extremely competitive prices to fly in Argentina. They also have a route to Iguazu, check prices and times for them here. Keep in mind that Fly Bondi does not fly out of the local airport in Palermo. It uses the newly reopened Palomar airport outside of town and you’ll need to take taxi there. They also charge for additionals like luggage and seat selection, similar to Europe’s Ryan Air. Iguazu is a breathtaking destination that deserves at least two full days. But, if you really don't have the time to spare, there are organized day trips from Buenos Aires to Iguazu Falls. You can book one like this high rated Iguazu day trip, and they will take care of everything, including the tour of the falls and airfare. Full disclosure: it will be a very long day. Iguazu is by no means on the outskirts of Buenos Aires, it's in the northeastern province of Misiones and the flight is an hour and a half. But if you only have one day to knock this off your bucket list, it's possible if you're willing. Reserve here. The bus company Rio Uruguay runs regular buses from the town of Puerto Iguazu to the falls. The buses leave every 20 minutes. The route begins at the Hito de los Tres Fronteras monument and stops at the bus station. The station (estacion de omnibus) is the easiest place for you to catch the bus. Both times I've visited from Argentina while living in Buenos Aires, so my point of view comes from using Argentina as a base. However, Brazil is just across the river. Both countries have national parks and offer completely different experiences for viewing the waterfalls. In Argentina, you really feel like you are IN the falls. There are multiple trails and paths to explore different angles and viewpoints. Iguassu on the Brazil side offers a more panoramic view of the falls (just look below). If you have the time, the budget and the visa (Americans need a visa for Brazil), I wholeheartedly recommend visiting both sides. If you don't have the time for both, I'd choose the Argentine side of Iguazu. There's just so much more to see here. With the upper circuit, lower circuit, devil's throat and the wildlife, you won't be disappointed. The Brazilian side is absolutely worth the time if you have the visa and the day to spare. As I mentioned above, the views are vastly different than from the Argentina side. It can be overwhelming figuring out how to navigate the visit on your own, so I recommend a guided tour like this one. Tours like this include hotel pick-ups and drop-offs as well as lunch, making it a complete experience. Reserve yours here. I've been to Iguazu twice. Once in 2010 and again with my parents in 2015. In 2010, the water was INTENSE (see above). Flooding had carried away some of the catwalks, closing off parts of the park. We were always drenched by the mist and spray. It was impressive! My roommate had visited the year before me and the falls were bone dry. This must be very rare, but from looking at his photos he might as well have visited the Grand Canyon. And in 2015, we noticed a change in just the three days we were there. Thanks to heavy rains upriver, the falls were much stronger on our third day than the first. The photos below were taken from the same angle, one is just more zoomed in. You'll have a unique visit, regardless of how much time you spend there. Enjoy that! Iguazu National Park in Argentina is open every day of the year from 8 am. You can enter the park until 4:30 in the afternoon, but you need to be out by 6. The cost is 700 pesos for non-residents. If you validate your ticket at the ticket windows when leaving, you'll receive a 50% discount on your second visit (must be next consecutive day). You can pay in cash (in pesos) or credit card. Your ticket includes everything. It includes access to all walking paths to the falls (upper circuit, lower circuit & Devil's Throat). It also includes the free ferry to cross over to San Martin Island (which is absolutely worth doing) and use of the Tren de la Selva train. There are restaurants and facilities within the park. There are buses from the Puerto Iguazu bus station that will take you to the park or you can take a taxi. You won't need a rental car in Iguazu. Budget for at least 6 hours in the park, minimum. If you can spend two days there, you'll be able to see everything. If you want to go to the Brazilian side, that will also need its own day. While I mentioned above that there are day trips to Iguazu from Buenos Aires, I don’t recommend this unless it’s truly your last resort. Give yourself two nights minimum to see everything at a relaxed pace, three or four nights are even better if you can spare them. Ideally, you want to be in Iguazu when it isn't the rainy season with clear skies, the temperature is mild, and the falls are at their fullest. It can be difficult to get all three to match up at once. December-February means high temperatures, humidity, and rain (but also powerful waterfalls). April-June is the dry season. August and September are dryer and cooler. Regardless of when you visit, you'll have a great visit. Iguazu is a great destination year round. Good times to avoid may depend less on rainfall and more on local holidays (and this goes for all of Argentina, not just Iguazu). If you can, avoid January and mid-July. This is peak travel season due to summer and winter break. Easter week is also a busy travel week for locals. There will be crowds and higher prices during these Argentine peak seasons. There are 2 main circuits: the Upper Circuit and the Lower Circuit. After entering the park, you can take the Tren de la Selva (or Jungle Train) to the Upper and Lower Circuits. The Upper Circuit is shorter and just half a mile and will take around an hour. It has catwalks leading you on top of the falls with views over the nearly 200 foot high waterfalls. It's very impressive. The Lower Circuit can take 2-3 hours to explore, with multiple viewpoints and paths. This is where you can catch the free ferry to San Martin Island (depending on water levels). You can also pay for a speedboat ride right up to and under one of the falls. After walking the circuits you can make your way back to the jungle train station to continue on to Devil's Throat. There are bathrooms and restaurants here as well. This nature walk takes you one hour into the jungle to the Arrechea Waterfall. Budget three hours for this activity, an hour to get there and back and an hour to swim or have a relaxing picnic. Iguazu National Park is rich in wildlife and choosing to do this hike is an excellent way to immerse yourself in the park. For a map and more information check here. Devil's Throat is absolutely worth the time involved. This is the highlight of the park. From the station, take the catwalk pathway leading you to the falls for a little over a kilometer (round trip will be about 2.4 km). Garganta del Diablo is massive. While walking keep your eye open for crocodiles and turtles in the water. The jungle of Iguazu is FULL of life. If you keep your eyes open you'll see a rainbow's worth of colorful birds, including toucans and the yellow-eyed bluebird (above). The coatis are the most noticeable as they are everywhere and not afraid of people in the slightest. Beware, this cute cousin of the raccoon can inflict painful bites and scratches, don't pet them. Watch your food, they'll steal it. In just seconds, before we knew it one had jumped onto our table, grabbed my mom's ice cream and was back in the grass eating her raspberry sorbet. Throw your food away in the bins. It broke my heart at night to watch the monkeys eat mayonnaise packets for dinner. 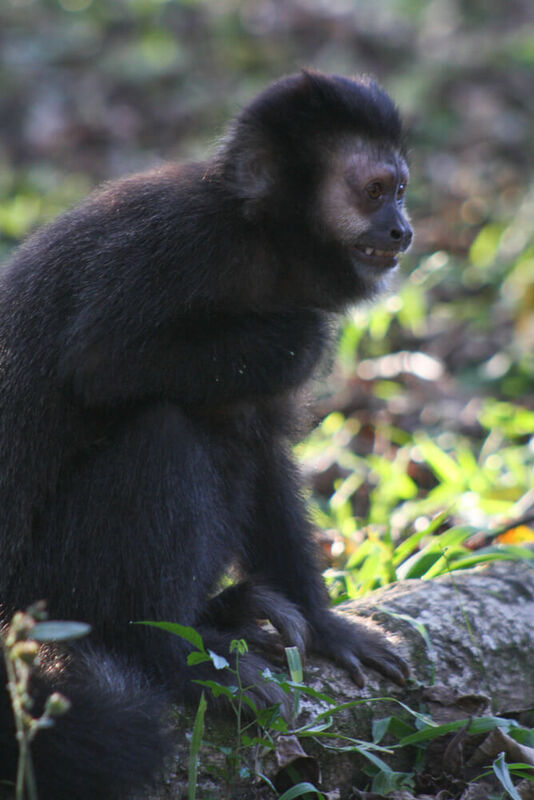 One night, when the park closed we were surprised by a troupe of monkeys and herd of coatis that seemed to come out of nowhere. They ran along the path, playing with each other as if we weren't even there. I just sat on the sidewalk and enjoyed the show until they decided to run back into the jungle. THE MELIA IGUAZU | If you're wondering where to splurge on your trip to Argentina, save it for Iguazu and stay inside the park. The Melia (previously the Sheraton) is located inside the Iguazu National Park grounds. You cannot beat that. You have direct access to the park and the falls by just walking along the path past the swimming pool. We were in the park at 8 am when it opened and had the park all to ourselves, enjoying views of the falls with no other tourists blocking our views, it was priceless. Wildlife was more active before the heat of the day set in and they disappeared into the forest. We could easily walk back to the hotel for lunch and lie by the pool before going back in for the afternoon. From our balcony we watched the morning fog lift with a direct view of the falls. If it's within your budget, don't think twice about staying at the Melia. Check rates here. MERCURE IGUAZU HOTEL IRU | Another gorgeous property in town is the Mercure Iguazu Hotel Iru. It's a beautiful property and great for a couple looking for a romantic getaway. HOSTELS | If you're a backpacker or on a tight budget, there are great hostels in the town of Puerto Iguazu. Check out the Hostel Iguazu Falls or the Butterly Hostel. With the kilometers and kilometers of paths within the park, pack comfortable shoes. But you're going to get wet, it's inevitable, so bring shoes and clothes that can wet. Teva Sandals are always a great option because they'll also give you good grip and traction. The catwalks can get slippery. KEEN and Chaco are also good choices. Consider bringing some plastic ponchos to toss over you if the spray gets really bad. It can really depend. I needed a poncho on my first trip but didn't use one at all on my second. A quick dry towel that you can toss in your backpack or tote to dry off after going on the boat ride (you will get soaked!). A water bottle, the jungle days get hot. I really like S'well bottles and never leave home without one. It keeps your water cold for 24 hours so it's always fresh, and the insulation also prevents condensation (keeping the rest of your bag dry). Protection from the sun: sunscreen, a hat, & sunglasses. A camera to capture the amazing views of the waterfalls! Hito 3 Fronteras | In the town of Puerto Iguazu, the Paraná and Iguazu rivers join and the three coastlines each form the border of a different country. Stand in Argentina and look across the water at Brazil and Paraguay. There's a small monument with the flags of the three countries that makes a fun photo op. La Casa de las Botellas |: Just outside of town, there's a house built entirely of plastic bottles. This perfectly livable house is built to promote a more eco-friendly way of life. Could be interesting if you're nearby, I wouldn't go out of my way for it. 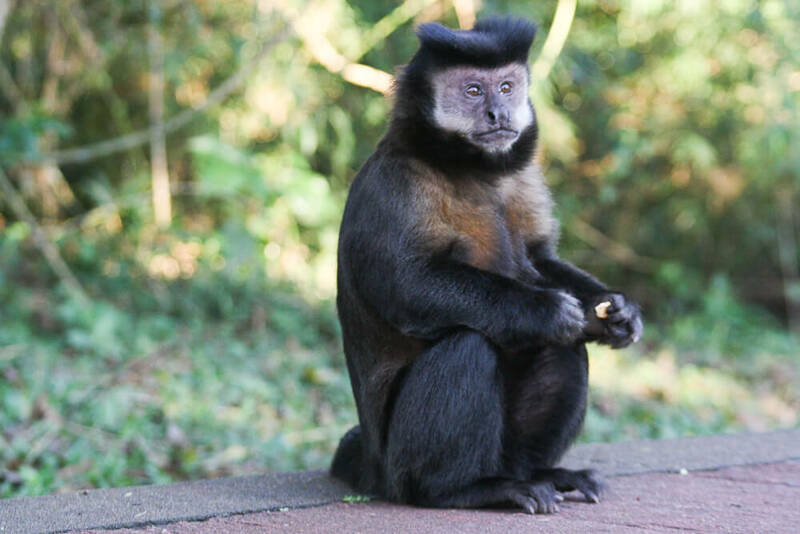 Biocentro Iguazu | I have heard great things about this park! The Atlantic Rainforest is one of the most threatened and diverse ecosystems in the world. Only 7% of the original forest remains. Visit this park that's working to conserve the ecosystem and its at risk species. You'll see animals here you may never see anywhere else (like a tapir!). You'll definitely see a wide variety of birds, butterflies, and fauna. There's a restaurant on the property to try local cuisine. San Ignacio Miní | Visit this Jesuit mission, founded in 1632. It is one of the most preserved of the Jesuit missions and was declared a UNESCO World Heritage Site in 1984. This is quite a trek from Iguazu and would need an entire day. If you're traveling through the rest of Misiones as well, it's very close to Posadas. Pretty much all organized tours also stop at Wanda to see the semi-precious stone mines along the way. Reserve your San Ignacio Tour here. I hope you enjoy your visit to Iguazu! If you have any questions, please ask below in the comments! Did I miss something? Let me know.